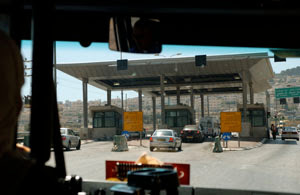 A checkpoint in between Jerusalem into the West Bank. 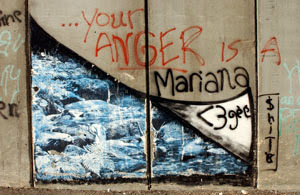 It is hard to represent the structure of the wall in photographs and its impact on the human psyche. I can only explain it like this: Once there was a road that went from one village into another and you could see for miles the hills and olive trees. Then one day, a large concrete slap in built on that road all grey, tall and ugly. The concrete blocks the road so you cannot go through anymore, but not only does it block the road, but also the beautiful view of the hills. It creates the feeling of isolation and a closed box. Once there was vast open air, and now it is stifling. Walking along the wall you just cannot see through it, around it, and what you once knew what was on the other side, the gas station, the coffee bar or the market. Life becomes closed and darker. Above is graffiti with a window view of what once was on the other side. 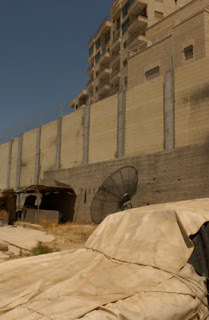 This is a "nice" wall in Abu Deis. 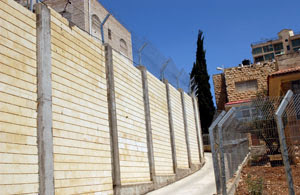 The locals gathered together and told the State that they did not want a gray wall going through their neighborhood. 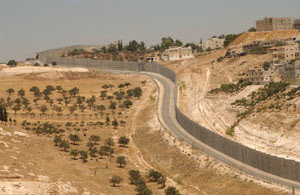 Israel bought the bricks, the locals built the wall. You can see how close it is to the homes, and the road that is cut off. 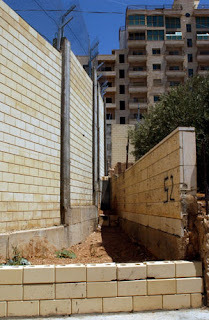 In Abu Deis, the wall divided the neithborhoods. Here you can see the homes on the other side. 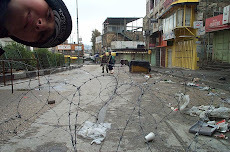 This used to be a "neighborhood" of families and friends, now they cannot get to one another unless they drive around through many checkpoints and spend about 2 hours. 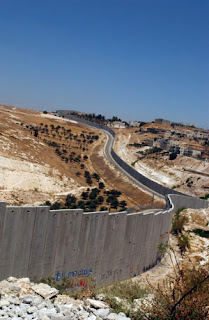 The Palestinian's dubbed the wall as "the snake" This is a good representation as to why. You can see the olive trees, and divisions in the land winding around water wells and homes. 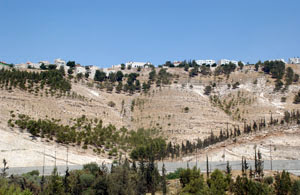 This is a new settlement near Abu Deis. This is the reason for the wall and the land that is being taken with it.